Nurses in Ohio are legally bound to "practice in accordance with acceptable and prevailing standards of safe nursing care." This course will acquaint nurses with the basics of the Ohio Revised Code, which is the legal parameter for evaluating and disciplining nurses within this State. The Board and Legislature use national practice standards, current, nationally recognized periodicals, and professional expertise to update or modify Ohio Code. The Board evaluates reported deviation from standards with relation to intent, pattern and circumstance. After the evaluation of the violation a nurse is adjudicated through due process action. The board may revoke or place restrictions on the nurse's license, reprimand, and levy a fine or take no action when standards have been breached with regard to competent practice, nursing process, patient safety, or delegation of duty. Thus, it becomes the prudent practice for each Ohio nurse to become familiar with the basic standards which govern the major areas of practice. Approval valid through December 31, 2020. Assigned ONA #22074, 1 contact hour for Category A. This one contact hour course is designed for all Ohio registered and licensed practical nurses. NetCE designates this continuing education activity for 1 ANCC contact hour(s). NetCE designates this continuing education activity for 1.2 hours for Alabama nurses. AACN Synergy CERP Category B. NetCE is authorized by IACET to offer 0.1 CEU(s) for this program. This continuing nursing education activity was approved by the Ohio Nurses Association, an accredited approver by the American Nurses Credentialing Center's Commission on Accreditation (OBN-001-91). Approval valid through 12/31/2020. Assigned ONA #22074, 1 contact hour for Category A. The purpose of this course is to provide basic knowledge of the current Ohio Revised Code and the Ohio Administrative Code for nurses in order to increase compliance and improve patient care. Ohio nurses are legally obligated to be aware of standards that govern professional accountability. Information contained in this course is not intended to be used in lieu of lawful guidelines, but as a learning tool that increases the understanding of some regulations as they apply to nurses who are licensed within the state of Ohio. Identify the organization and mission of the Ohio Board of Nursing. List the components of the nursing process, as related to the practice of registered nurses and licensed practical nurses in the state of Ohio. Recognize the importance of safe nursing practice. Identify nursing violations that may result in the revocation of a license. Sally Anthony, MS, RN, Paralegal, received her paralegal certification in 1992. She received her master\'s degree in health education in 1982 and has been a registered nurse for more than 30 years. As a medical-legal consultant for more than 20 years she has worked with attorneys on medical malpractice cases and personal injury cases. In addition, she donates her time to work with legal interns at the Gonzaga University Legal Assistance program. Her nursing practice has taken place in a variety of clinical settings that are as diverse as post-open heart advanced care and child legislative testimony. She had also worked as a health educator, consulting nurse, psychiatric/chemical dependency assistant nurse manager, regional poison center director and medical-surgical nurse. She currently works as a medical-legal consultant and is an award winning medical writer. Contributing faculty, Sally Anthony, MS, RN, Paralegal, has disclosed no relevant financial relationship with any product manufacturer or service provider mentioned. The reading committee member has disclosed no relevant financial relationship with any product manufacturer or service provider mentioned. The Nurse Practice Act dates back to 1915, when the Ohio Legislature sought to regulate and reform nursing in the state with regard to education, competence, and standards of practice, and although it was initially met with resistance by healthcare professionals, the intent was for patients to receive a higher level of care . Today, registered nurses (RNs), licensed practical nurses (LPNs), and advanced practice registered nurses in the state of Ohio are legally bound to "practice in accordance with acceptable and prevailing standards of safe nursing care" established and codified as a result of the Act . The Ohio Board of Nursing, as an agency of the state, is charged with the responsibility of administering and enforcing Chapter 4723 of the Ohio Revised Code (ORC), the legislation that arose from the Nurse Practice Act and which established the Board of Nursing. The practice of registered nurses, advanced practice registered nurses (certified nurse practitioners, clinical nurse specialists, certified nurse midwives, and certified registered nurse anesthetists), licensed practical nurses, dialysis technicians, medication aides, and community health workers is regulated by the Board, which has set forth administrative rules in Chapter 4723 of the Ohio Administrative Code (OAC). According to state law, the Ohio Board of Nursing is required to review their Code at least once every five years. Thus, it becomes the prudent practice for each Ohio nurse to become familiar with and periodically review the basic standards of practice and the laws and rules that govern the major areas of practice for both the RN and LPN. This course will acquaint nurses with the basics of Chapter 4723, which is the legal parameter for evaluating and disciplining nurses within this state. The Ohio Board of Nursing consists of 13 members and includes eight registered nurses (at least two of which must be authorized to practice as an advanced practice registered nurse), four licensed practical nurses, and one consumer member that represents the interests of consumers of health care . A president and vice-president are elected from among the members; these positions are one-year terms. Board members serve four years, commencing on the 1st day of January and ending on the 31st day of December. In addition, the Board employs a full-time Executive Director who is a registered nurse. The Board's mission is "to actively safeguard the health of the public through the effective regulation of nursing care" . The Board evaluates reported deviation from standards with relation to intent, pattern, and circumstance. After evaluating a possible violation, a nurse is adjudicated through due process action. The Board may revoke or place restrictions on the nurse's license, reprimand and levy a fine, or take no action when standards have been breached with regard to nursing process, patient safety, competent practice, or proper delegation. The basic standards of competent practice directly impact how both RNs and LPNs provide care . Not only must a nurse possess the knowledge of lawful and current care standards, but the knowledge must be demonstrated through consistent practice and intervention to prevent unauthorized, inappropriate, erroneous, illegal, contraindicated, or intentional nonperformance of care. The Board has provided a tool for scope of practice decision making (Figure 1) . This tool may be helpful in determining if an activity or task is within the defined scope of practice. Source: Ohio Board of Nursing. Decision Making Model. Available at http://www.nursing.ohio.gov/PDFS/practice/Decision_Making_Model.pdf. Reprinted with permission from the Ohio Board of Nursing. Assessment of health status involves collecting and documenting data from the patient, family members, significant others, and other members of the healthcare team. The RN may direct or delegate the performance of data collection. Analysis of individual patient needs should utilize skills and reasoning, including identification, organization, assimilation, and interpretation of data to establish, accept, or modify a nursing diagnosis. The patient's health status and nursing diagnosis must be reported to other members of the healthcare team. Planning for care involves the development, establishment, maintenance, or modification of the nursing plan of care consistent with current nursing science, including the nursing diagnosis, desired patient outcomes or goals, and nursing interventions. It must be communicated to other team members in a timely fashion to allow for input and modification or implementation. Implementation involves executing the nursing regimen; implementing the current plan of care; providing nursing care within the RN's documented scope of education, knowledge, skills, and abilities; assisting and collaborating with other healthcare providers in the care of the patient; and delegating appropriate nursing tasks. In some cases, this also involves collaboration in the administration of care that has been ordered by a licensed practitioner. Evaluation of the patient's response to nursing treatment is a critical component of nursing practice. Progress toward expected outcomes should be documented. RNs should also reassess the patient's health status and establish or modify any aspect of the nursing plan. After performing the evaluation, the RN must communicate the patient's response to others who are involved in the patient's care and seek medically prescribed modification when indicated by prudent nursing judgment. Under the Nurse Practice Act, practicing as an LPN is defined as providing to individuals and groups nursing care requiring specialized knowledge, judgment, and skill derived from the principles of biological, physical, behavioral, social, and nursing sciences at the direction of a licensed physician, dentist, podiatrist, optometrist, chiropractor, or registered nurse . When the LPN is properly trained and supervised, this care may consist of special tasks. The practical nurse contributes to the assessment, planning, implementation, and evaluation of care while communicating information to others . The knowledge and ability of the LPN are significant contributions to the assessment of the effect of medical orders and nursing diagnoses. Therefore, it is important that this information, whether objective or subjective, be imparted in a careful and timely fashion to the rest of the healthcare team. These data will be interpreted by an RN or other certified practitioner for the purpose of planning an individualized system of care for each patient. Notification of the possible need for modification of a new or ongoing plan or emergent intervention is a critical duty. The LPN is then involved in implementing the nursing plan of care in an accurate and timely manner, which may include providing nursing interventions; collecting and reporting patient data as directed; administering medications and treatments prescribed by an individual who is authorized to practice in this state and is acting within the course of the individual's professional practice; providing basic nursing care as directed; collaborating with other nurses and other members of the healthcare team; and delegating nursing tasks as directed, including medication administration, in accordance with the law. While contributing to ongoing care in a skillful and efficacious manner, the LPN is able to observe patient outcomes and provide further evaluation reports to the directing RN or healthcare provider and documentation for members of the treatment team. A registered nurse with a current, valid license to practice nursing in Ohio may use a title or initials denoting specialty certification in a particular area of specialty in nursing granted by a national certifying organization . These nurses are considered advanced practice registered nurses (APRNs) and include certified registered nurse anesthetists, clinical nurse specialists, certified nurse-midwives, and certified nurse practitioners. An APRN may provide nursing care that requires knowledge and skill obtained from advanced formal education and clinical experience. A nurse authorized to practice as a certified nurse-midwife, in collaboration with one or more physicians, may provide the management of preventive services and those primary care services necessary to provide health care to women antepartally, intrapartally, postpartally, and gynecologically, consistent with the nurse's education and certification, and in accordance with rules adopted by the Board of Nursing . No certified nurse-midwife may perform version, deliver breech or face presentation, use forceps, do any obstetric operation, or treat any other abnormal condition, except in emergencies. However, this does not prohibit a certified nurse-midwife from performing episiotomies or normal vaginal deliveries or repairing vaginal tears. A certified registered nurse anesthetist, with the supervision and in the immediate presence of a physician, podiatrist, or dentist, may administer anesthesia and perform anesthesia induction, maintenance, and emergence, and may perform with supervision preanesthetic preparation and evaluation, postanesthesia care, and clinical support functions, in accordance with rules adopted by the Board . The supervising physician, podiatrist, or dentist must be actively engaged in practice in Ohio. A certified nurse practitioner may provide preventive and primary care services, provide services for acute illnesses, and evaluate and promote patient wellness within his or her nursing specialty, in collaboration with one or more physicians or podiatrists and in accordance with rules adopted by the Board . A clinical nurse specialist, in collaboration with one or more physicians or podiatrists, may provide and manage the care of individuals and groups with complex health problems and provide healthcare services that promote, improve, and manage health care within the nurse's nursing specialty . As of 2013, a certified nurse practitioner or clinical nurse specialist may determine and pronounce an individual's death, but only if the patient's respiratory and circulatory functions are not being artificially sustained and if, at the time the determination and pronouncement of death is made, the individual was receiving care in a nursing home, a residential care facility or home for the aging, or a county home or district home; any RN may pronounce death if the nurse was providing or supervising the individual's care through a hospice care program or any entity that provides palliative care [2,10]. The nurse is required to notify the individual's attending physician of the determination and pronouncement of death within a period of time that is reasonable but not later than 24 hours following the determination and pronouncement of death [2,10]. Nurses are not responsible for completing any portion of the death certificate. The authority to administer the drug is delegated to the person by an APRN who is a clinical nurse specialist, certified nurse-midwife, or certified nurse practitioner and holds a certificate to prescribe. The drug is listed in the formulary (established under section 4723.50 of the Revised Code) but is not a controlled substance and is not to be administered intravenously. The drug is to be administered at a location other than a hospital inpatient care unit; a hospital emergency department or a freestanding emergency department; or an ambulatory surgical facility. The person has successfully completed education based on a recognized body of knowledge concerning drug administration and demonstrates to the person's employer the knowledge, skills, and ability to administer the drug safely. The person's employer has given the APRN access to documentation, in written or electronic form, showing that the person has met these conditions. As of 2016, certified nurse practitioners, clinical nurse specialists, and certified nurse-midwives are authorized to treat their patients' sexual partners for certain diseases without having examined the partner, in accordance with ORC 4723.481 . Display applicable identification indicating licensure as a registered nurse or licensed practical nurse, including area of practice (e.g., certified nurse-midwife). Identify to each patient or healthcare professional the nurse's title or initials when engaged in nursing practice through telecommunications. Delegate a nursing task only in accordance with Board rules. Report and document nursing assessments or observations in a complete, accurate, and timely manner. This includes care provided by the nurse for the patient, and the patient's response to that care. Report to the appropriate practitioner errors in or deviations from the current valid order. The OAC 4723-4-06 states that all licensed nurses must take measures to promote a safe environment for each patient. Specifically, this includes delineating, establishing, and maintaining professional boundaries with each patient. When providing direct nursing care to a patient, licensed nurses should treat each patient with courtesy, respect, and with full recognition of dignity and individuality. During examination or treatment and in the care of personal or bodily needs, privacy should be respected and given. Licensed nurses should not engage in behavior that causes or may cause physical, verbal, mental, or emotional abuse to a patient. Patients are always presumed incapable of giving free, full, or informed consent to sexual activity with the nurse. In 2014, the General Assembly of the State of Ohio passed HB 341, which mandates query of the Ohio Automated Rx Reporting System (OARRS) under specified circumstances . This bill requires all APRNs who hold certificates to prescribe (CTP) and who prescribe opioid analgesics or benzodiazepines to register with OARRS by January 1, 2015. In addition, beginning April 1, 2015, a 12-month query of OARRS must be completed (and documented) prior to "initially prescribing or personally furnishing an opioid analgesic or benzodiazepine" . Regular monitoring of these patients is also required if treatment continued for more than 90 days. CTP holders who are in violation of these laws are subject to disciplinary action. APRNs may also prescribe or personally furnish a drug to up to two sexual partners of a patient . In 2016, Ohio legalized the use of medical marijuana for qualifying conditions. However, nurses may only possess or administer medical marijuana if they are registered with the Pharmacy Board as a registered caregiver for a specific registered patient . As of September 2018, nurses, dialysis technicians, and employees working in nursing homes, residential care facilities, home health, hospitals, community mental health, and other work sites who have reasonable cause to believe that an adult is being abused, neglected, or exploited, or is in a condition that is the result of abuse, neglect, or exploitation, are required to immediately report such belief to the Department of Jobs and Family Services in the county where the adult resides [14,15]. Ohio also has a statewide, toll-free number for reporting elder abuse: 1-855-OHIO-APS (855-644-6277). Reports can be made by phone, in writing, or in person. Engaging in criminal activity, either in the course of practice or outside of a practice setting, may be grounds for disciplinary action. Criminal activity is defined as being convicted of or pleading guilty to a misdemeanor or felony. In the case of a misdemeanor committed in the course of practice, there may be a finding of "eligibility for a pretrial diversion or similar program or intervention" . The Board may impose sanctions for being convicted of a felony in relation to gross immorality or moral turpitude, the illegal sale of drugs or therapeutic devices, or committing a crime outside of the jurisdiction of the state that would constitute a felony or misdemeanor in the state of Ohio . Any action that causes impairment is also grounds for sanction by the Board. This includes self-administering dangerous drugs without a prescription and habitual indulgence of habit-forming drugs, alcohol, or other chemical substances. A physical or mental disability may also impair the nurse's ability to practice according to acceptable and prevailing standards of safe nursing. If a nurse's license has been revoked due to mental illness or incompetence, the Board may reinstate the license upon proof of competence through adjudication of a probate court . Other violations include assaulting or causing harm to a patient, depriving a patient of the means to summon assistance, and using intentional misrepresentation or material deception to obtain money and/or anything of value in the course of practice. The nurse who fails to establish and maintain professional boundaries with a patient or engages in sexually inappropriate behavior, physically or verbally, is also eligible for disciplinary action . Disciplinary action may also result from violating safety precautions. Safety violations include the failure to use universal blood and body fluid precautions and the failure to practice in accordance with acceptable and prevailing standards of safe nursing care. Engaging in activities that exceed the scope of practice of the licensee is deemed unsafe. In addition, aiding and abetting the practice of nursing by a person who does not hold a license is grounds for sanction by the Board . The Ohio Board of Nursing has established the Patient Safety Initiative in collaboration with nursing employers with the goal of increasing patient safety through effective reporting, remediation, modification of systems, and accountability . The Initiative established the Practice Intervention and Improvement Program, the Board's confidential alternative to discipline program for eligible licensees. The program establishes a structured remedial education and monitoring program to document that the participant's practice deficiency has been corrected . When a complaint is filed, Board staff present the case to the Board Supervising Member for Disciplinary Matters for review and disposition . Many complaints do not result in public disciplinary action, but remain confidential and closed unless subsequent violations are reported. In keeping with due process, as defined in Chapter 119 of the Ohio Revised Code, the nurse is provided the opportunity for a hearing, the outcome of which may be to deny, revoke, suspend, or place restrictions on the license; reprimand, fine, or otherwise discipline the nurse; or take no action . Nurse B has been an RN for almost 20 years. One night, there is an unusually heavy caseload at the emergency care facility where she works. One patient at the facility is 32 years of age and presented with dehydration and heat stroke. The patient is showing signs of altered consciousness and has a rapid heartbeat and low blood pressure. Nurse B is one of two RNs on duty, so the task of starting the patient on a 0.9% normal saline IV has fallen to Nurse W, an LPN who began administering intravenous therapies approximately 2 weeks ago. With the initial assessment and plan of care complete, Nurse B decides to leave Nurse W to start the rehydration drip unsupervised because he seems confident in his ability to administer IV fluids; this frees her up to assist patients with multiple trauma. Although Nurse B has not personally supervised Nurse W during IV administration, she knows that this LPN is quite competent in other nursing tasks. When Nurse W offered to administer the saline, he confirmed that he has completed a Board-approved IV therapy course pursuant to ORC 4723.17. Additionally, Nurse B states that she will check back soon, and if any problems should arise, that she is to be notified immediately. The task of administering IV saline is within a LPNs scope of practice and is within the rules governing LPNs (Section 4723.17.03B of the Ohio Revised Code). With the patient assessment completed and the results of the nursing task reasonably predictable, the RN may be generally correct in directing an LPN to complete this procedure. She was also correct in reminding the LPN to notify her pending a change in patient status and that she would return to check on the patient. However, Nurse W is relatively new to administering IV fluids, and it is unclear whether he has attempted to establish a line on a dehydrated patient with the possibility of collapsed veins. Before directing Nurse W, Nurse B should have evaluated whether an improperly performed task could cause a life-threatening consequence. In this case, an improperly placed IV line or failure to access a vein may lead to a worsening of the patient's condition. Furthermore, because supervision was not available at the time and because Nurse B failed to ascertain from a supervisor whether Nurse W was competent in IV administration to dehydrated individuals, directing Nurse W to complete the task was not in the best interest of the patient. Nurse A is an RN, 37 years of age, working in a busy university hospital's cardiac intensive care unit who possesses a good deal of first-hand experience monitoring anticoagulant therapies. An obese male patient, 65 years of age, is admitted early in the morning with acute bilateral deep vein thrombosis in his femoral veins, confirmed by ultrasonography; the patient has a history of chronic heart failure, and his international normalized ratio (INR) is 0.5. Attending Physician G, an intern, has ordered the patient to be started on an initial dose of warfarin 5 mg and enoxaparin. The patient care plan involves daily monitoring of INR and possibly titrating the warfarin dose to achieve a therapeutic INR of 2.5. For three days the patient's INR has been rising slowly to 1.5 on dosages of 7.5 mg and then 10 mg of warfarin. When Nurse A arrives for her shift after her day off (on day 5 of the patient's treatment), she discovers that in an attempt to speed the therapy, the intern has titrated the warfarin to 20 mg and the patient's INR is at 2.4. She knows from experience that warfarin dosages of 10 mg for heavier patients are acceptable, but 20 mg seems to be an overly aggressive approach, considering a peak effect of 36 to 48 hours, so she decides to ask Physician G to reduce the dosage back to 10 mg or to discontinue use. The physician admits not having experience administering anticoagulants and agrees to lower the dose to 5 mg.
As a member of the healthcare team, it is a registered nurse's duty to contribute his or her knowledge, experience, and observations to improve patient safety and outcomes. Pursuant to OAC Section 4723-4-03-E, nurses should implement a current valid order unless they feel the order is inaccurate; not properly authorized; not current or valid; harmful or potentially harmful to a patient; or contraindicated by other documented information. In this instance, the nurse's judgment dictated that implementing the current order of administering warfarin 20 mg had serious potential to be harmful to the patient. It is important to remain vigilant regarding patient safety and to document and voice concerns regarding the patient's individualized system of care. It is the responsibility of the Ohio Board of Nursing to enforce the laws and rules regulating the practice of nursing as the law is currently stated and not how individuals may wish the law to be. However, as nurses are affected by these rules and regulations, they have the responsibility to keep informed of regulatory changes and provide public comment regarding regulations. All Board meetings, held every two months, are open to the general public. In addition, the Board seeks public input through its newsletter, Momentum. For those individuals with special concerns, the Board may hold special forum sessions. For more information please contact the Board at 614-466-3947 or http://www.nursing.ohio.gov. Practice issues or questions may be sent directly to the Board by email to practiceRNandLPN@nursing.ohio.gov or practiceAPRN@nursing.ohio.gov. 1. Ohio Board of Nursing. Available at http://www.nursing.ohio.gov. Last accessed December 4, 2018. 2. Ohio Revised Code. Chapter 4723. 3. Ohio Administrative Code 4723 Chapters 1 through 23. 4. Ohio Administrative Code Rules 4723-4-03, 04, and 05. 5. Ohio Administrative Code Rule 4723-4-06. 6. Ohio Revised Code Section 4723.28. 7. Ohio Board of Nursing and Nursing Employers. Patient Safety Initiative: Creating a Culture of Safety and Accountability. Available at http://www.nursing.ohio.gov/PDFS/Discipline/PatientSafety/PSI-Booklet01212011.pdf. Last accessed December 4, 2018. 8. Ohio Board of Nursing. Decision Making Model. 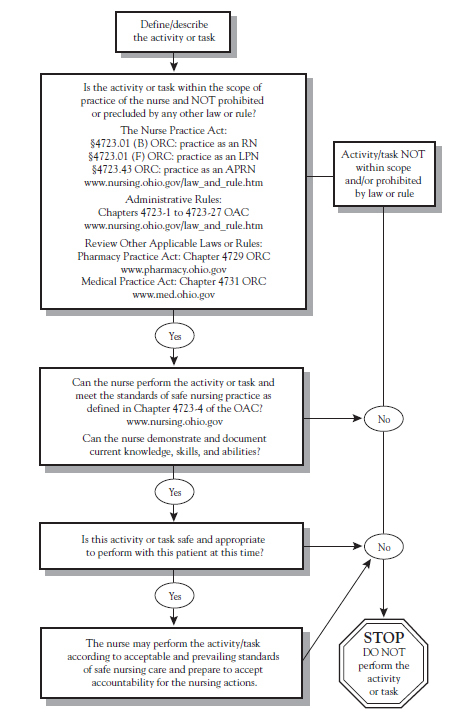 Available at http://www.nursing.ohio.gov/PDFS/Practice/Decision_Making_Model.pdf. Last accessed December 4, 2018. 9. Rodabaugh JH, Rodabaugh MJ. Nursing in Ohio: A History. Columbus, OH: Ohio State Nurses' Association; 1951. 10. Ohio Board of Nursing. New Ohio law: determination and pronouncement of death. Momentum. 2013;41:10. 11. Ohio Board of Nursing. New requirements for APRNs with prescriptive authority (CTP holders). Momentum. 2014;3:10-12. 12. Ohio Board of Nursing. New APRN law: delegation of authority to administer drugs. Momentum. 2015;4:14. 13. Ohio Board of Nursing. Expedited partner therapy and APRNs: HB 124. Momentum. 2016;1:12. 14. Ohio Revised Code 5101.63 Reporting abuse, neglect or exploitation of adult. 15. Ohio Department of Jobs and Family Services. Understanding Elder Abuse: A Guide for Medical Professionals. Available at http://www.odjfs.state.oh.us/forms/num/JFS08097/pdf/. Last accessed December 4, 2018. 16. Ohio Board of Nursing. Medical marijuana and the role of the APRN, RN, and LPN. Momentum. 2018;16(3):10-11.